We’ve come almost to the end, my friends. 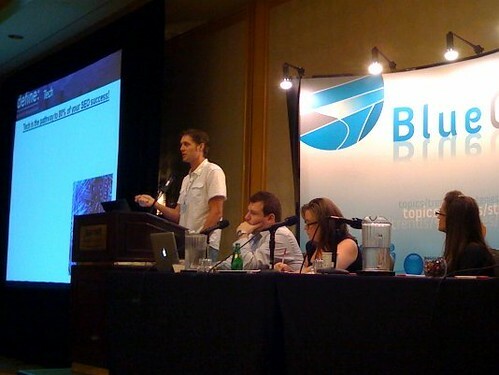 With just one site review session after this, you are looking at the last liveblog to come out of BlueGlass LA. 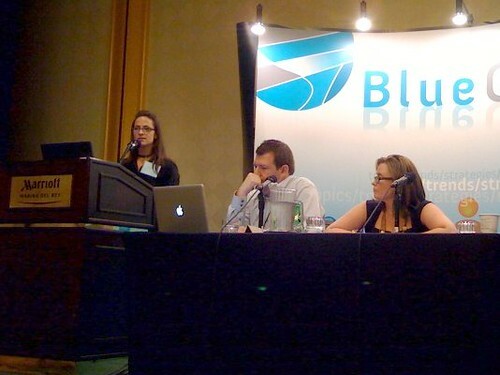 Speakers Jessica Bowman, Founder, SEOinhouse.com, Marshall Simmonds, Chief Search Strategist, New York Times Company/About.com, Co-Founder and CEO, Define Search Strategies, and Laura Lippay, Director of Technical Marketing, Yahoo! Media are bringing it on home. Tony Adam says he’s starstruck and that these are the people he looks up to most when it comes to inhouse. He points out there are three former Yahoos on the panel: Laura, Jessica and himself. Jessica is up first. 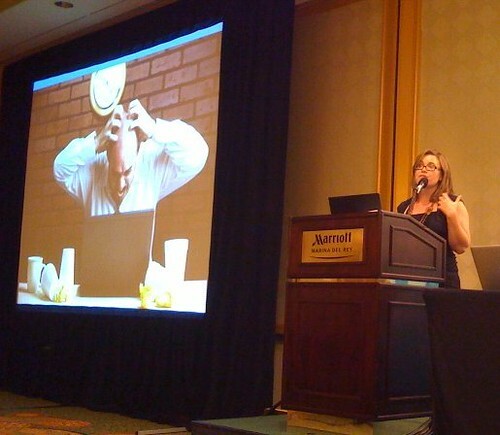 She’s going to be covering why it’s so hard to get SEO implemented in a large organization. You need efficiency and accountability in order to do it. You need a healthy organization for good SEO (quoth Gord Hotchkiss). SEO crosses many disciplines and you end up getting a reputation for sticking your nose into everyone’s business. You need to be part of every team and project. Courtship and Honeymoon: Yep, everyone’s on board, everyone wants you in the meeting, they’re excited. Training happens. Leverage those happy feelings to get changes made. It only lasts 6-9 months. Reality: But behind the scenes, the programmers are pulling their hair out. Then there’s a project manager who think you’re out of scope. This can last for over two years. Synergy: Things are good but not perfect. What happens once you get buy-in? Don’t assume that your battle is done. Buy in is only the first step. You still have to sell the lower level people. SEO requests: add to man hours, are inconsistent with other goals, go against existing programming standards, weren’t technically feasible, added to the project timeline and cost. The challenge often is keeping everyone in line with your approach to SEO. They try to run ahead or do end runs around the bots. You need to educate them about best practices and doing things strategically. 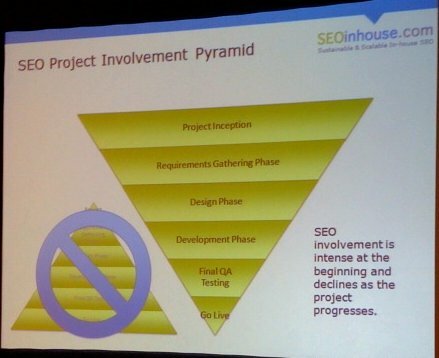 SEO needs to be built in and a big part of the development lifecycle. If you don’t, you pay in opportunity cost because you probably haven’t budgeted right. Before delivery is accepted, be sure that SEO has been consulted. Training and Mentoring is key. Involve SEO in project planning and add SEO to the standards and guidelines of the entire organization. Contribute to project deliverables. You can get back into honeymoon phase with expert trainers, sending people to conferences, etc. Really great presentation. I didn’t do it justice. Laura Lippay is up next. She’s now with NinebyBlue and no longer with Yahoo. Her presentation is basically her story at Yahoo. How data, beer and monroe’s motivated sequence got me everywhere: tales of an ex-Yahoo Inhouse SEO. Her first challenge was getting to know people. So she took people out and bought them beers and got to know them. She didn’t have good analytics when she first started. Literally, all she had was unique visitors for the whole property. She had to teach herself microstrategy, took excel classes and spent months creating reports. She didn’t really get any SEO done in the first few months. Next obstacle: It needs to be done in two months. Solution: Be realistic and honest. Don’t just say yes to impossible tasks. Obstacle: Educating the masses. Solution: Provide accessible tools, best practices, resources & data. Train (often with beer). Annual internal conferences (beer). Newsletters and reports. Obstacle: Implementation Solution: Reporting and persuasive data had to be in place first. At that point, she was promoted and moved over to Marketing, which helped. They needed to prioritize who to work with first. Did it by opportunity and willingness to work with them as well as if the property was worth it to Yahoo. Problems with integrating with teams = didn’t fight back, but did report the unwillingness. Set realistic expectations up front. Provide actions, not recommendations. Make sure to document and report gaps where SEO fell off the roadmaps. Integrate SEO checks into the QA process. In 2009, she lost her entire team and had her role completely redefined. This moved her to social media. She started her process over. Beer, persuasion methods, in-person meetings. Check out her slideshare: lauralippay for older presentations. Much of it wasn’t feasible. it’s a 10k person. He doesn’t want to talk to senior management or the people in the trenches. He wants to talk to the people who report to the senior managment. They’re the ones with the budgets. He finds the most success working through the tech team. Without tech buy-in, you’re screwed. Education — tech teams won’t come to trainings over and over. They don’t spend a lot of time trying to get them to understand tools and trends. They’re equipped to write the content. They don’t use webmaster central. It’s buggy, it doesn’t scale around the 20-50k page mark. Backfill webtrends and omniture with Google analytics. Get a budget and build a tool inhouse if you have to. It is a good thing that SEO is now been taken seriously. Many people are now sharing their knowledge about how to earn in this business. P.S not usre if you allow links in comments, just felt the link was suitable. Thank you so much for sharing your knowledge and perspectives. It is appreciated. SEO as part of the development process is something we all really need to push for. It’s good to see it being raised.